April | 2014 | Franchising You. Owning a business, building a franchise, growing a career is not just about the money. Or is it? 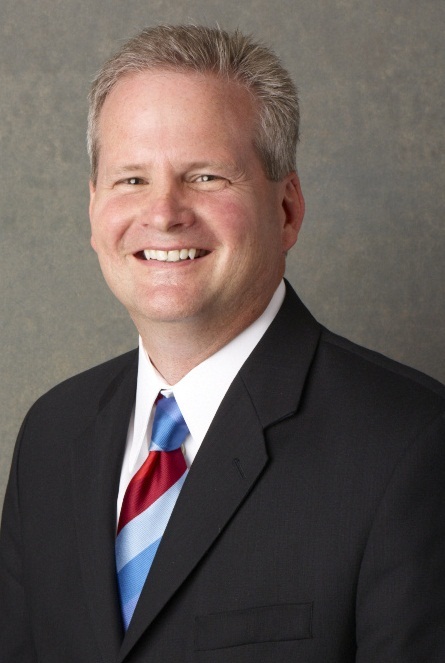 Jeff Wesley CFO at TWO MEN AND A TRUCK®/INTERNATIONAL, Inc.
Let’s see. As a chief financial officer, I’m often accused of focusing too much on the money. People say, “Money isn’t everything,” and “There is so much more to life than money.” These statements are true, of course. But establishing a sold fiscal plan or discipline is absolutely key to viable and consistent success. While I agree, money isn’t everything, it’s the foundation which allows solid leadership the momentum to provide the means to create something special. In the TWO MEN AND A TRUCK® system, franchise profitability is at an all-time high with average profitability starting at 13 percent. This is important. It enables franchises to have a solid return on investment, pay our valued team members, and invest in training, equipment, and improved operations. So it is about the money. Without the bedrock of solid profitability, funding growth is not possible, customer service declines, leads diminish and well, you know the rest. From a corporate perspective we’ve earned 35 record months of consecutive growth. Our system has doubled in size in just the last four years. This too, is important. Growth allows us, as a franchisor, to invest in both people, operational improvements, and technology to support our franchisees and the progress and profitability of their businesses. Business never rests and we need to evolve to meet the needs of today’s customer. Once a business is profitable, there is another cool thing that happens. And here is where folks say, “It’s not just about the money.” And I agree wholeheartedly; it’s about so much more than the money. It is about supporting communities with jobs, providing a needed service, and giving back to those organizations and causes evoking passion within each of us. Since inception, the TWO MEN AND A TRUCK® culture has focused on giving back to the communities in which we live and work, beginning when Founder Mary Ellen Sheets donated her entire first-year profits to ten charities Franchisees enjoy connecting with a culture which is fiercely passionate about giving back. Combining the charitable side of the brand with the profitable franchise business model, franchisees are given the opportunity to be heroes. And because TWO MEN AND A TRUCK® franchises are profitable, they have the resources to give back. And the giving back culture doesn’t simply mean writing a check. That’s an important part, of course. But our franchises and corporate team members roll up their sleeves and give of their time and energy. And time is money, especially to nonprofit organizations operating with limited budgets. We build homes, we serve at homeless shelters, we organize fundraising galas, we donate boxes to various coat and food drives, we serve on nonprofit boards. We impact communities everywhere we exist. In fact, TWO MEN AND A TRUCK® franchises donated nearly $2.5 million in moving services to nonprofit organizations in 2013, in addition to thousands of dollars in boxes and packing supplies. And for this reason, I can’t understand those people who don’t care about money. We must make money to have the means to deliver on our passions. Without it we can’t take care of our communities, our at-risk moms and children, our veterans, our neighbors. If you are looking at franchise systems, here are some tips to ensure you’re profitable so you can give back to your community and build a legacy. TWO MEN AND A TRUCK® is so passionate about giving back we donate $.10 of each move to the American Cancer Society in addition to creating Movers for Moms®, our signature cause marketing program. TWO MEN AND A TRUCK® is making great things happen for the customers and communities we serve. Money and profits help us impact lives and we are grateful and proud where we can make a difference. Visit our website to learn more. So, you’re interested in buying a franchise business. Are you confident you have the financial, operational, and general business administration experience and knowledge to be successful but are unsure how to best market and advertise for success? Do high-tech marketing tactics – PPC, SEO, social media, online directories and review sites, email marketing – make your head swim? Don’t fret; you are not alone. At TWO MEN AND A TRUCK® we have an entire team of marketing experts dedicated to ensuring the successful marketing and advertising of your new location, as well as marketing best practices to help grow your business for years to come. Our Home Office marketing team will assist you in all aspects of the marketing funnel from building an effective marketing plan to tracking your lead sources and conversion rates to monitoring website traffic trends. We’ll share with you the best practices of our more experienced and successful franchisees in areas ranging from effective grassroots marketing to identifying the best keywords which drive online traffic and ultimately sales. 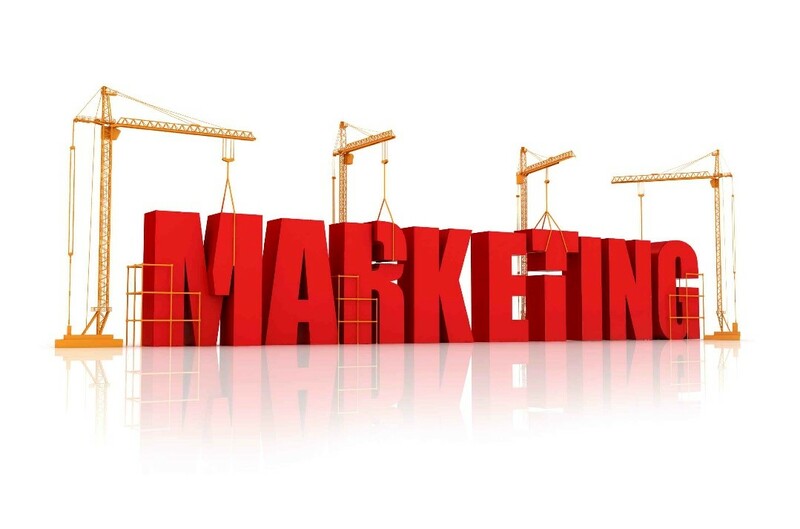 An important initial step in your marketing success is creating a well-balanced marketing plan which includes tactics for generating awareness, driving leads, and creating a strong, positive local brand image. Our team will assist you by helping you tailor a marketing plan to your location based on your local demographics, special features of your geographic area, level of existing brand awareness of TWO MEN AND A TRUCK® in your area, and those marketing opportunities unique to your city or region. One major advantage of franchising with TWO MEN AND A TRUCK® is you will have corporate marketing support at your disposal to help guide your decisions and strategy while still having the freedom to make final decisions independently within specified guidelines. TWO MEN AND A TRUCK® Home Office marketing team works with a public relations agency to position your location effectively in order to leverage local news outlets, business organizations, and online forums. This is an important, and often overlooked, step in getting to know your local business community. Grassroots marketing is of course crucial to the success of your business. Building solid relationships with local businesses and referral sources is a key component of successfully establishing your location within the community. We’ll share with you specific, proven best practices for inexpensive yet effective grassroots marketing. We’ll help you identify businesses to target, local business organizations to join, and potential referral sources to cultivate to quickly create a healthy network of local referrals for robust lead flow. Awareness tactics are of utmost importance as well. We’ll help you select the best media, whether it’s TV, radio, direct mail, billboards, newspapers, or a combination of these tactics, to generate awareness based on your specific local market demographics and characteristics – and of course your budget! Our experienced and knowledgeable lead generation team will educate and assist you in managing your online lead flow. We’ll assist in creating your local website, work with you to identify the best local search terms for your city or region, and ensure you are targeting the customers most likely to actually use your services. We’ll make sure you are getting great high-potential lead volume, as inexpensively and quickly as possible. We even have charity and cause marketing programs created exclusively for TWO MEN AND A TRUCK®, such as Movers for Moms®, an annual event designed to collect items for women and their children living in shelters. TWO MEN AND A TRUCK® also has cause marketing programs designed to help homeless pets, assist military veterans, and ensure less-fortunate children and adults have plenty of food and warm clothing to wear during the winter months. All of these cause marketing programs help to create local and national awareness and build positive brand image for TWO MEN AND A TRUCK® – an important form of local marketing and advertising. Additional Home Office services provided from the national advertising fund are graphic design services, crisis communication assistance in the event of a disaster or other emergency, PR help in the event of a news-worthy local story or event, and social media support for help in creating engaging and effective Facebook posts. Marketing training is ongoing as well: Home Office hosts marketing training at Home Office at least six times per year, Marketing Roadshows travel to various regions throughout the year to make training more accessible to all regions of the country, and team members perform franchise visits throughout the year. Additionally, online marketing support is available 24/7 via our intranet. The marketing team is also available five days a week, from 8 a.m. to 5 p.m. EST, to immediately assist via email or phone with any questions you may have. Want to learn more about becoming a TWO MEN AND A TRUCK® franchise owner? Click here for more information. 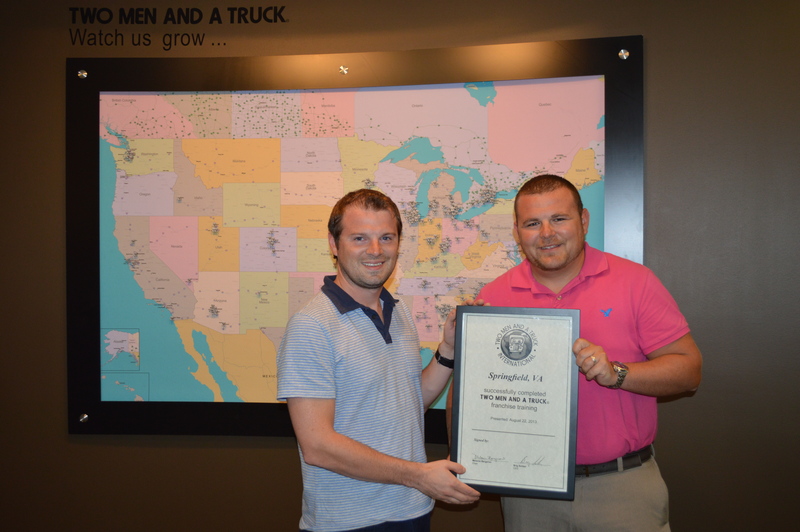 In the last year, TWO MEN AND A TRUCK® has focused efforts on expanding its east coast presence and has recently opened locations in Virginia and Maryland. Locations which have launched in these two states experienced immediate growth. 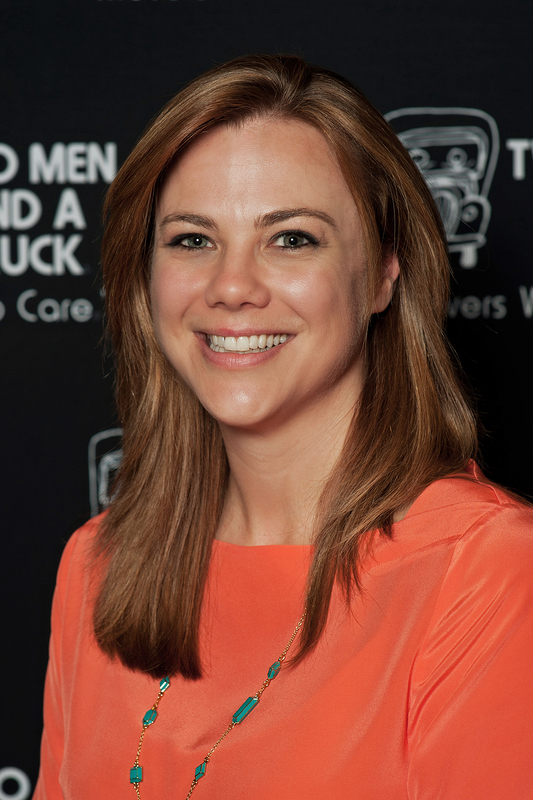 We recently spoke with three east coast TWO MEN AND A TRUCK® franchisees: Brooke Wilson of Bethesda, Md. ; Nick Bocock with locations in both Richmond and Chesterfield Va.; and Martin Pollack of Springfield Va. Our goal was to learn about both the achievements and the challenges each has encountered and the strategies employed to continue to grow their locations. Q: What accomplishments have you experienced since opening your franchise(s)? Brooke: Within the first two months of operation, we are exceeding previously established sales goals. Additionally we have already adjusted 2014’s annual goals to reflect the market’s potential of achieving well above $1 million revenue in the first 12 months of operation. Martin: The first thing which made me proud of my operation is, while acknowledging our short existence, we have already grown to the point where we have 30 employees who have the opportunity to make a decent, honest living. The other element we take a huge pride in is our Do Good program. Through the program, we commit to giving back to our community by donating one percent of our revenue to five local charities. Our first donation in January went to The Yellow Ribbon Fund. Q: What hurdles have you ran into? Brooke: Weather! With my prior experience in North Carolina and Georgia, snow was a rare occurrence. We’ve had to develop action plans for weather preparation in Maryland; we’ve awoken to 12 inches of snowfall overnight this past winter season! Plowing and shovels weren’t part of our original operational plan, but we quickly adjusted. Having a staff committed to the new franchise’s success, plus the value of their local knowledge of the area, has been instrumental in overcoming that hurdle. Martin: I think the two biggest struggles we have had are real estate and employment. We are in three of the highest per capita income ZIP codes in the nation, leading to limited real estate where we can position our physical offices. As a result, we moved twice in the first three months of operation. Luckily we’ve landed a place to call home, an address which will offer us the space we’ll need in the future. Nathan: We focus on running a great business first and foremost; everything else usually falls in line from there. We have learned having the right team members is a must. Without quality people with a service orientation, you will only ever run a mediocre business. What drew you to the TWO MEN AND A TRUCK® brand? 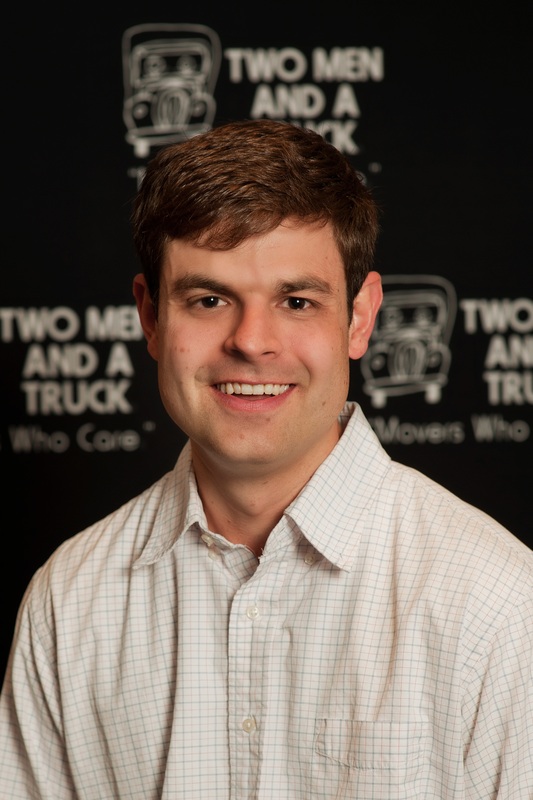 Nathan: I learned about TWO MEN AND A TRUCK® from a good friend, Roger Boyer, who owns a successful TWO MEN AND A TRUCK® office in Columbia, S.C. The brand stands out in a cluttered market of moving companies. The brand has become familiar in a “household name” way; add our special blend of service and it’s an iconic proposition in the making. Brooke: I came to TWO MEN AND A TRUCK® fresh out of college. The job was supposed to be temporary while I searched for a job in my field of study. I quickly fell in love with the company and recognized many opportunities to positively contribute to the franchise system. For more information on starting your own TWO MEN AND A TRUCK® franchise location and the performance information available to prospective owners, click here.